The run start is at 24th Street. The course heads south and is an out and back course. 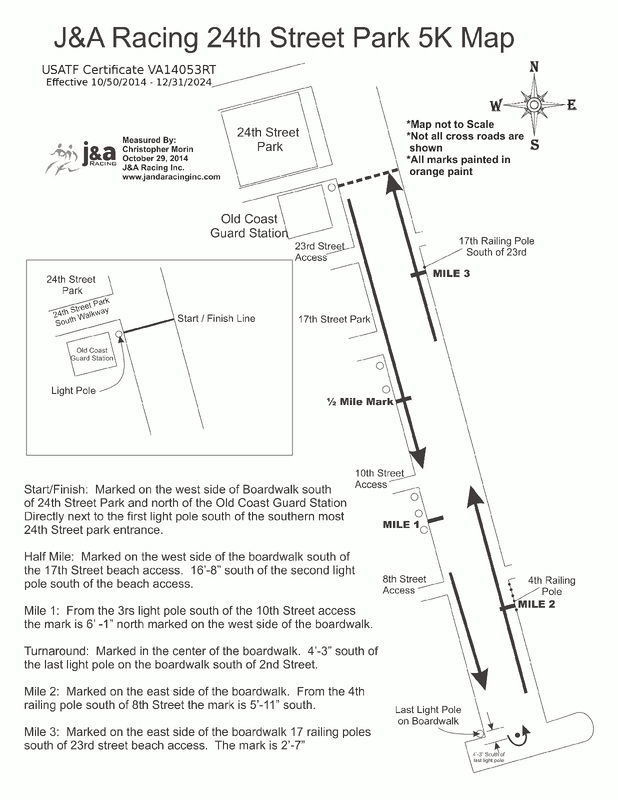 The Run-Swim-Run is composed of a 1K beach run, 1K ocean swim and 5K run on the boardwalk. Run north from 24th Street sign to 33rd Street sign. Swim back to 24th Street and exit up stairs/ramp to start run. There will be a cone and a volunteer to direct you in to the water for the swim start. Run south from 24th Street sign to just north of pier in front of sign that is on the beach adjacent to the Boardwalk. The sign says "Danger no swimming / surfing bodyboarding 200 feet from pier" There will be a cone and a volunteer to direct you in to the water for the swim start. The City parking garage at 25th Street will be open at 6am. There is a $10 parking fee at all City lots on weekends. Metered parking is also available.